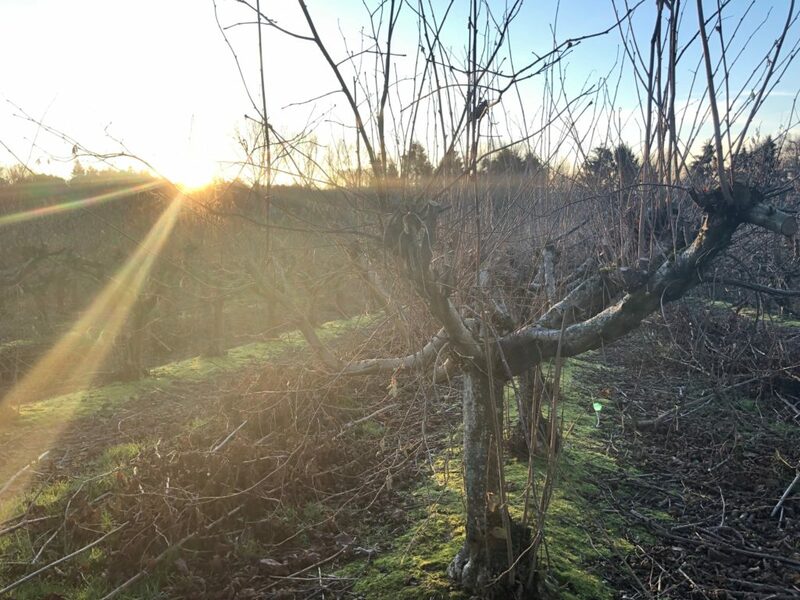 I have returned to work after the Christmas break full of resolve to prepare for a great fruit picking season in the summer, and one resolution is to write more regularly about what is going on in the winter months. At this time of year Cathy comes in one day a week and has been training the blackberries and tayberries, a job that requires thick gloves. When the ground has not been too sticky she has been splitting and transplanting rhubarb as well. 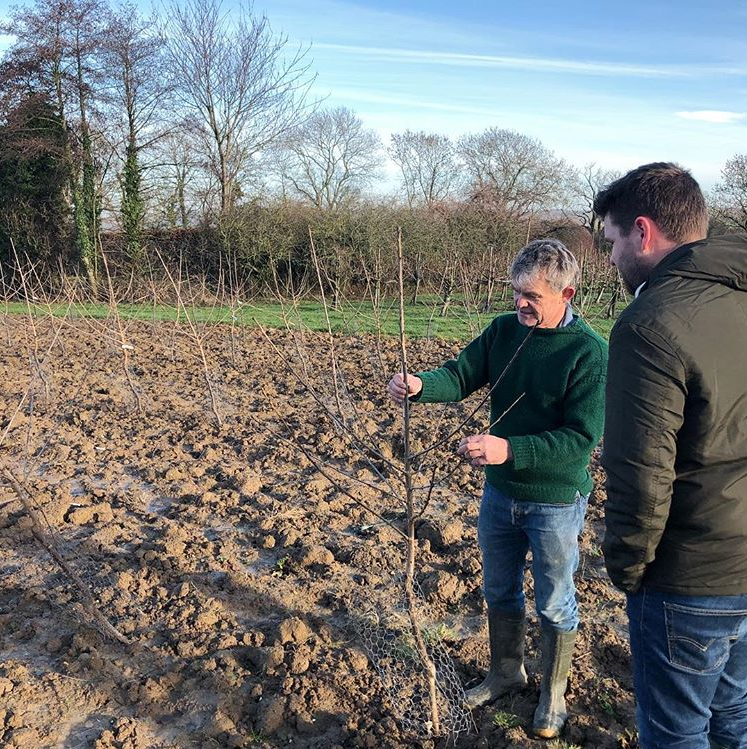 This year was remarkably dry through October so I could get on with tractor work later than usual, and we were able to prepare and plant a new 600 tree cherry orchard, a job that usually has to wait until March. These are all late varieties (early August) planted very intensively as you will see and we will have to wait 3 years for significant cropping. 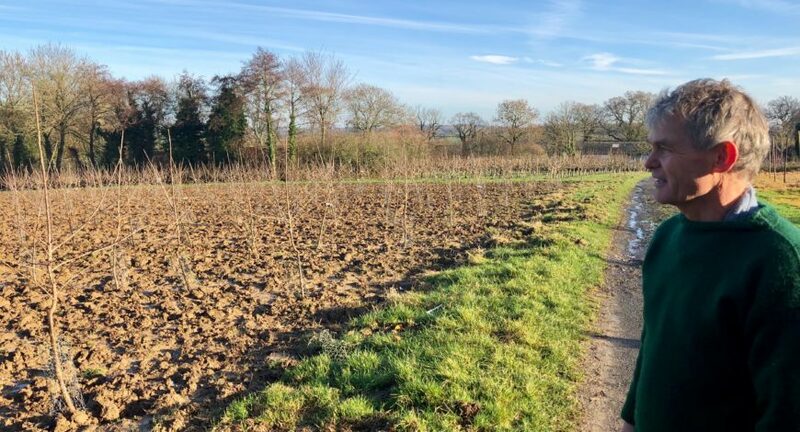 Hopefully the orchard we planted 3 years ago (earlies, late June) will have a good crop this year and we will have our biggest crop yet! After a disastrous raspberry year getting production up to meet demand is a priority. We got some in the ground before it got wet, but most will have to wait until March. We are trying a technique which should mean cropping this year, if we get the irrigation right. The Estival apples are pruned and half of the nuts…. I usually spend a couple of hours a day on this job which keeps it enjoyable rather than boring. Plums and cherries wait until the sap is rising to reduce disease. Although leafless and muddy in places, the farm continues to look good in the winter sunshine. It is a great place to live and work! The season of fruit is over – thank you for coming! January 13, 2019	Happy New Year! November 2, 2018	The season of fruit is over – thank you for coming! August 7, 2018	August update! It is Plum and Blackberry season – Hooray! June 11, 2018	Strawberries and Rhubarb are ready!